I just love hearing the sound of our dog snoring. When he snores, I know he’s at peace and feels safe within his environment. As a matter of fact, his snoring makes me feel comfortable too. But if your dog is a loud snorer that disturbs your own sleep, that could be a problem. Many dogs snore and it’s a normal behavior but snoring can also be an early sign that something physically is just not right with your dog. Is a Blockage a Concern? Snoring occurs when there is a blockage in the upper respiratory tract. That’s the respiratory path from the nose to the trachea (which transports air to the lungs). Air forced through these passages create the snoring sound we hear. After running, jumping, and chasing the cat all day, a dog needs good, solid sleep in order to maintain good health. Dogs even experience REM sleep much like we do. If snoring constantly disturbs that sleep and is waking up your pooch, then it’s time for a vet trip! Many explanations can be found as to why your dog is snoring and a few can be found around your house. Maybe while playing with his favorite toy he swallowed it and it’s lodged in his throat. Or, maybe he swallowed something from outside? If this is the case and you can’t dislodge the item – you’re right – an emergency visit to the vet is in order. Does your dog have a very short nose or a long nose? Believe it or not the muzzle of your dog does play a factor into how much your dog snores! Certain flat faced dog breeds happen to be more prone to snoring than others breeds. Short nosed dogs like the Boston Terrier, the Pugs, and Bulldogs will be more likely to have night time breathing issues because they have shorter air passages and have to work harder to breathe. Also, breeds like the pug have redundant skin folds that may often result in snoring due to blocked passages. Excess tissue may require surgery on these breeds to remove tissue and relieve the blockage. The condition of each breed should be evaluated by your vet to be sure that your dog doesn’t require a medical or surgical intervention. Just as we do, dogs can have a sensitivity to allergens such as dust, pollen, perfume, and even other pets! This all can lead to airway constriction and snoring. Dogs putting on more pounds can also add up to extra throat tissue capable of blocking their airways. Obesity can also cause the rings in his trachea to collapse and cause snoring during sleep. Weight loss can, thankfully, reverse the damage caused by being overweight. 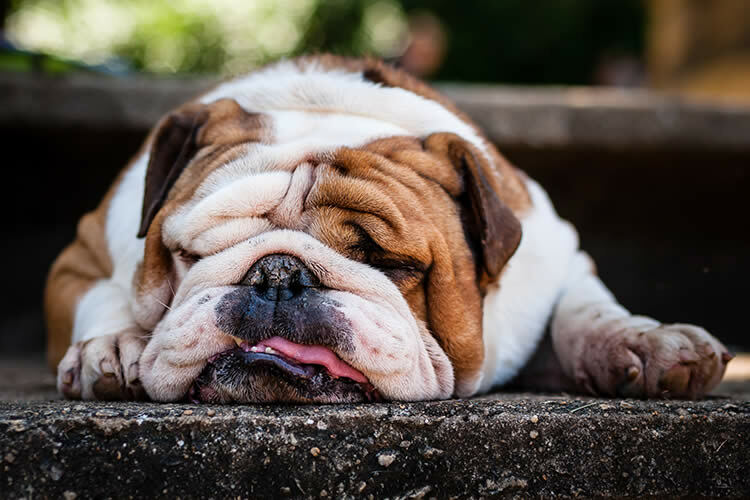 Relaxers such as painkillers, muscle relaxants, and other drugs can relax your dog’s muscles so much that his throat muscles loosen up and cause snoring. Untreated dental problems can cause infection throughout your pet’s body and cause snoring, but even more serious problems can arise from an abscessed tooth and other dental problems. Still need an excuse to stop smoking? Secondhand smoke can damage your pet’s’ respiratory system and lead to asthma, bronchitis and, yes, snoring. Aspergillosis, the results of fungal disease, can cause snoring. Triggered by a mold picked up on grass, hay, straw, or dust, this fungus enters through the moist lining in the nose and can result in sneezing, nasal discharge, and snoring. Colds and stuffy noses can cause inflamed mucus membranes that can result in nasal discharge, labored breathing, and snoring. Does your dog curl up when sleeping or does he lie on his back or on his stomach? Back and stomach sleep can place more pressure on your dog’s respiratory tracts. Sleeping on their sides can alleviate the problem or at the very least lessen it. Dogs who are typically silent sleepers can begin snoring when dry air causes nasal tissues to stick together. Altitude changes or varying air pressure can be the culprit. Snoring really isn’t a problem for a dog unless it’s interrupting his sleep or causing breathing problems during the day. If you notice nasal discharge, sneezing, or a bloody nose, call the vet for an appointment to ensure there are no medical reasons for your pet’s symptoms.